Roses were already considered ancient when in Eresos (Hometown of THETA Foods), in 270 B.C., the ‘˜Father of Botany’ Theophrastuswrote for the very first time about the one-hundred petal roses in his masterpiece ‘The Plants’. Then came Honey with Rose Petals. Ancient Greek Myths are the first to speak of its existence. Spoil yourself with the benefits of this 100% pure honey with rose scent. A rose by any other name would smell as sweet. When it’s paired with pure honey derived of Greek wildflowers, however, it’s something far more special. This 130g container of rose-infused honey is the purest distillation of sensuality and unbridled hedonism. Use on/with: Such a divine exquisite quality honey should be consumed only straight in small portions, in order to enjoy the flavor of roses and their petals. Taste: Smooth sweetness with the strong feeling of roses. Production: Lab Tested. Produced under ISO 22000 standard. Extracted using a rare technique in order to maintain the aromas of fresh rare red roses. Packaging: This exquisite honey with edible rose petals is packaged in a collectors’ item square glass honey pot made of Italian high quality glass. 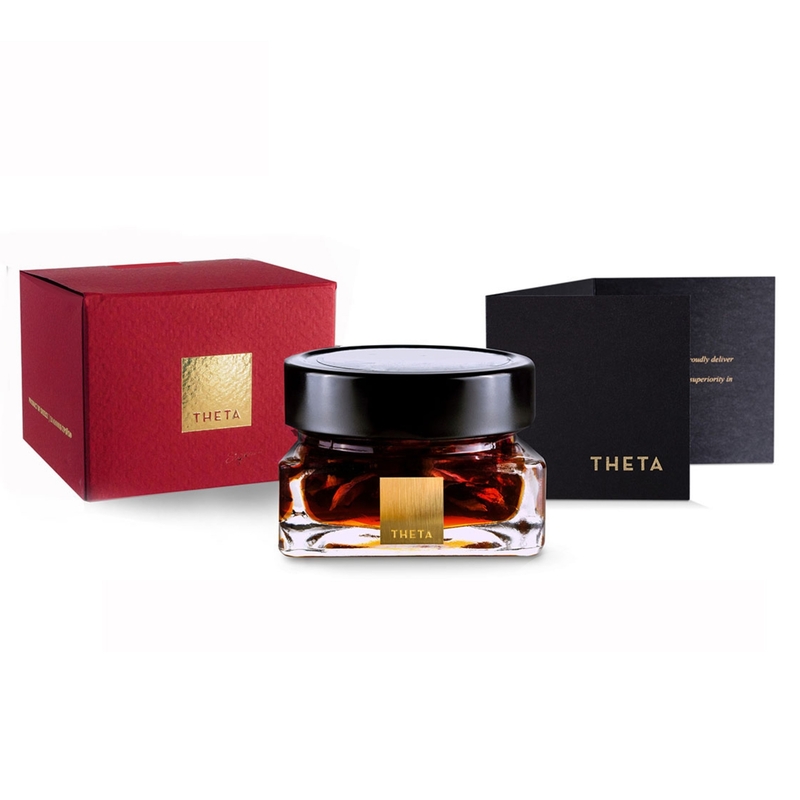 Affixed to this designer jar is a gold plated label with a laser engraving of the company’s name: THETA. The jar comes in a luxury handmade matte red gift box. Experience the worldwide unique taste of the most exquisite quality Chios Mastic infused in our honey.